I’d never heard of Skrei until I was contacted by the Norwegian Seafood Council about it. 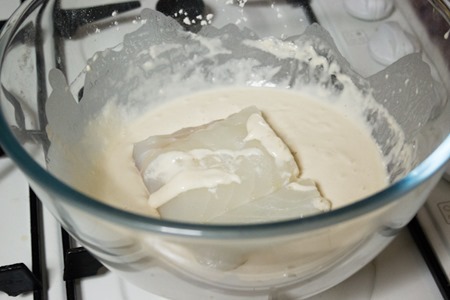 Apparently it’s “a very special type of cod, line caught, and a much loved Norwegian delicacy”. As far as I can tell, skrei is actually just the Norwegian word for cod, though I can’t work out whether it’s Atlantic Cod, Pacific Cod (unlikely), Greenland Cod or some other species entirely. It doesn’t help that Google Translate tells me that torsk is another Norwegian word for cod, but doesn’t differentiate between it and skrei. Still, I’m hooked by the information that it’s line caught – which I know has a massively smaller environmental impact than trawling with massive nets, as there is less bycatch (of unwanted species and undersized fish). 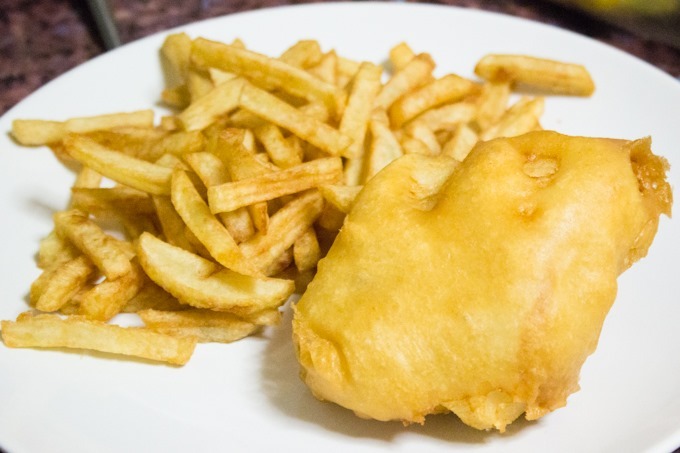 Of course, I’ve read that cod is one of the species that has been overfished and should therefore be avoided until stocks recover, but I’ve also read that sustainability depends on which region or fishery it comes from and some cod fisheries are alright. It’s confusing and makes it hard to know what the responsible choice is. 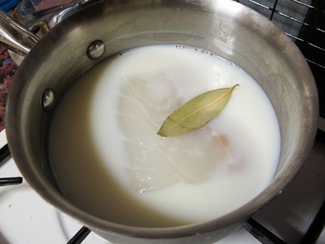 The press release also tells me that skrei annually migrate thousands of miles from the Barents Sea to the Lofoten Islands in northern Norway to reproduce, and this long journey through icy waters results in a “lean, bright white firm flesh [that] is rich in protein, vitamins and minerals”. It goes on to boast that top chefs Mitch Tonks and Michel Roux Junior both love skrei, with the latter featuring it on his menu for the last two years. I complete the unstated suggestion – that if it’s good enough for them it’s good enough for me – and accept the kind offer to review a sample. The cod fillets are firm, plump and a pleasingly subtle shade of ivory. As you’d expect from fresh fish, they have very little smell at all. They’ve not been pin boned very well so we make a slight mess of them trying to pull out a couple of large bones, before cooking. 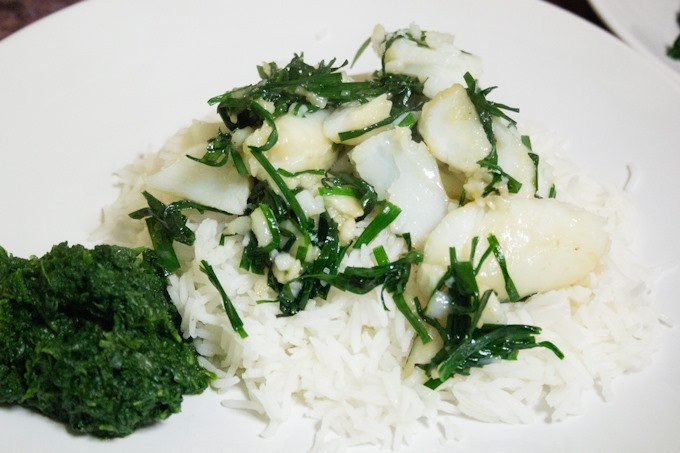 An adapted recipe from the Jekka’s Herbs Cookbook which calls for sea bass and garlic chives but tastes fabulous with cod and regular chives. 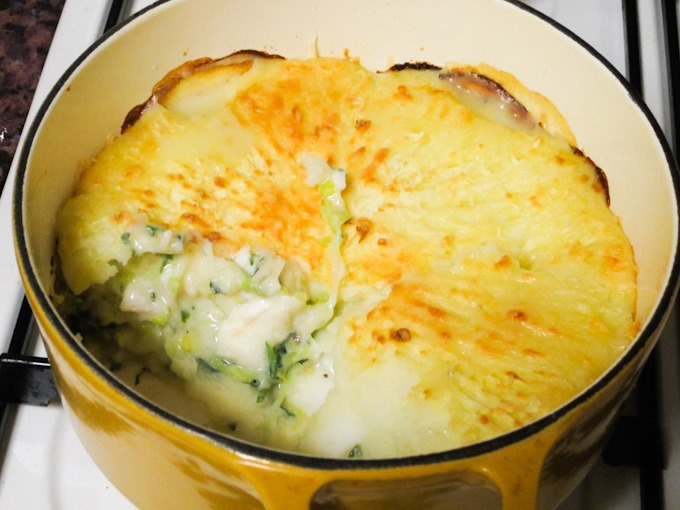 A fish pie recipe from the The Billingsgate Market Cookbook which bulks out a small piece of fish with hard boiled eggs and leeks, and is everything warm and comforting that a good fish pie should be. 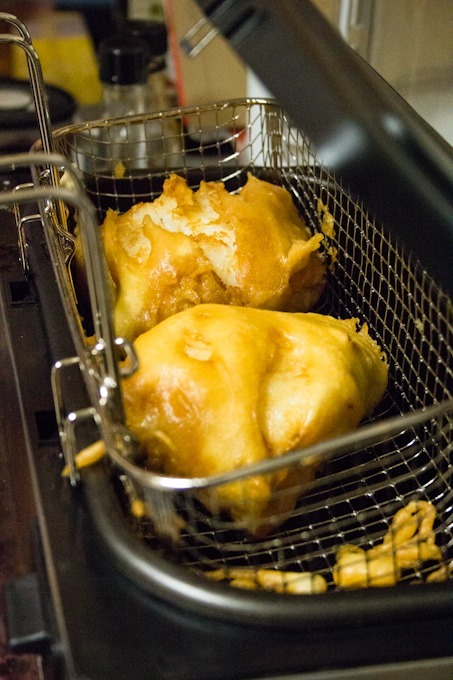 And lastly, beer battered fish and chips, which we discover is an excellent way to appreciate the texture of the fish, as it stays moist and flaky inside its protective coating. 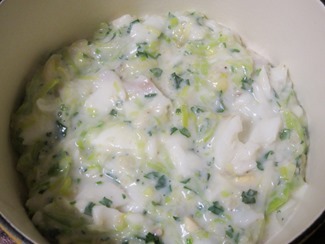 Whilst we really enjoyed all three meals, I’m not sure whether we would have noticed a huge difference had we used a different white fish such as hake, haddock or pollock. Of course, as I said above, it’s not as simple as some species being ok and others not, but a case of taking fishing method and area into account too. The Marine Conservation Society’s website, Fish Online, is an excellent resource for anyone keen to eat great fish and protect our marine environment and wildlife. if you are lucky enough to have access to a quality fishmonger, they should also be able to advise you on which fish you can use for a given recipe or cooking method, and all their produce should be sustainably sourced. 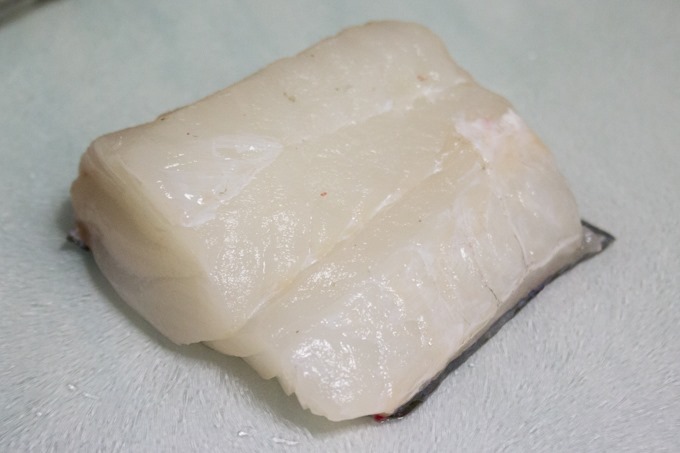 Kavey Eats received review samples of Norwegian skrei. Hundreds of millions of Norwegian cod make the migratory journey I described above but only a small percentage of all landed cad meet the standards to be branded as Skrei, which is a registered trademark. To be classified as Skrei the fish needs to be caught fully grown (approximately five years old), have immaculate skin with no scratches, bruises or injuries, be packaged within 12 hours of being caught, be stored on ice between 0° and 4° Celsius and, if sold whole, have Skrei branding fastened to the dorsal fin. It is fished in the Barents Sea, which can be classified as the North East Arctic, so not Pacific or Atlantic. All Norwegian cod is sustainable – indeed Norway has had cod quotas increased this year because stocks are so strong. 6 Comments to "Cooking with Cod: Norwegian Skrei"
I wonder if you had made a simpler dish where the fish was less processed, if you wouldn’t have seen a greater difference. I am thinking of something like simply baking the cod with butter and capers. Then the structure of the fish would have been very evident and the flavour more intense? I would say capers have a far far stronger flavour than the mild combination of mirin and chives we did for one portion, and likewise the battered cod. 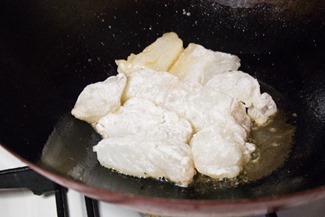 The fish wasn’t “processed” much in either of these two dishes so both texture and structure were left intact. Tonight we made miso cod which was superb. Hi there! Skrei denotes a specific population of cod (Gadus morhua) that wanders between the Barents Sea and northern Norway. The word ‘skrei’ itself has ancient Norse roots and means ‘to pace’ or similar, since they pace back and forth between Barents and Norway. ‘Torsk’ is the Norwegian common name for the species, but includes all other populations, most of which are stationary. Fantastic, thank you so much. I couldn’t find this kind of detail on Google (though probably I could if I could read Norwegian). Really appreciate your taking the time to fill me in – very happy to learn this. Thank you! Thank you so much, Mym for all the extra information. I love the idea of these cod as wanderers… that’s a lovely translation actually. Thank you!